These are Middle Paleolithic (MSA) Nubian cores from Upper Egypt. The early Nubian Complex has already discussed here: 1135 . There are two sub-types of Nubian Levallois core preparation, referred to as Nubian Type 1 and Type 2. 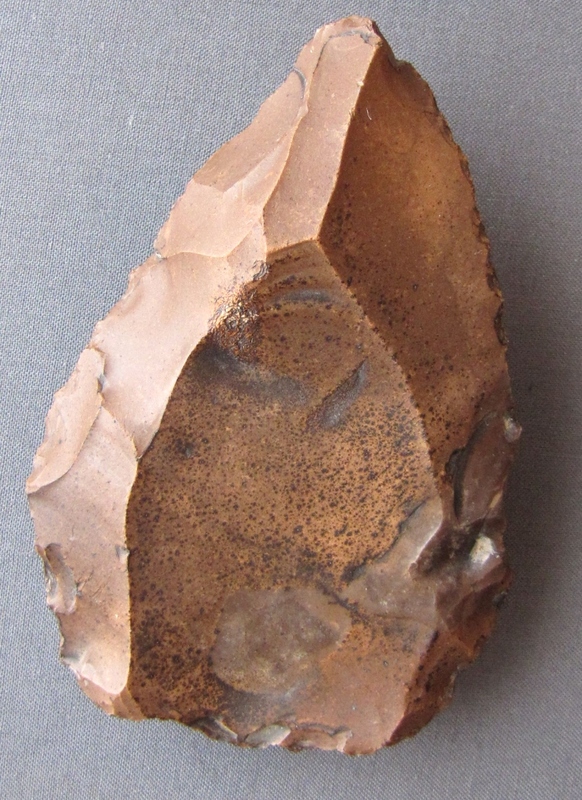 The Nubian type-1 core method enables the production of Levallois points and pointed blades by means of a central ridge created from the platform opposed to the one from which the future Levallois flake would be struck. The distal ridge, which lies approximately along the axis of the core is created by striking two unidirectional divergent removals undertaken from the distal part of the core. A series of smaller flakes is then removed from the sides of the other end of the core and a facetted platform is prepared for the removal of the Levallois point. Type 2 cores are marked by an elaborated centripetal preparation arranged perpendicularly to the central axis of the triangular silhouette of the Levallois surface from which a Levallois point, unlike the ‘‘classical’’ Levallois points is struck (Classical points are usually produced by a preferential Levallois point production with unidirectional convergent preparation; Guichard and Guichard 1964). Nubian Levallois core preparation strategy is technologically dissimilar to the Levallois point-producing industries found at nearby Levantine Levallois-Mousterian sites, which are broadly characterized by preferential unidirectional-convergent and centripetal reduction systems. 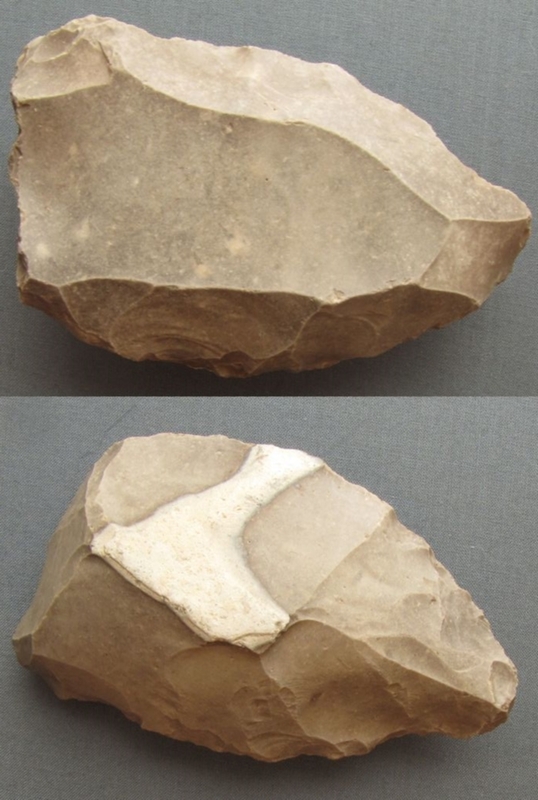 The early Nubian Complex is distinguished by a higher frequency of Nubian Type 2 cores in conjunction with bifacial foliates, thick scrapers and handaxes. It is suggested that the foliates are a heritage of the Lupemban and some researchers have even hypothezed that the Aterian is rooted in this early Nubian complex. The late Nubian Complex, on the other hand, shows a predominance of Nubian Type 1 cores and a complete absence of bifacial reduction. Retouched tool types are uncommon; they include rare sidescrapers, notches and denticulates, atypical burins, Nazlet Khater points, and truncated-faceted pieces. Late Nubian Complex assemblages have been found in stratigraphic succession overlying early Nubian Complex horizons at Sodmein Cave and Taramsa Hill 1 in Egypt; in both cases separated by a chronological hiatus. The early Nubian Complex roughly corresponds to early OIS 5 or even OIS 6, while numerical ages for the late Nubian Complex in northeast Africa fall in the latter half of OIS 5. The geographic extent for the “Nubian Complex was initially confined to Egypt/Northern Sudan and the surrounding Eastern Sahara. Some ensembles in the oases of the western desert seem also to have affinities to the Nubian complex. Some isolated Nubian sites at the Horn of Africa (K’One, Hargeisa, and Gorgora Rockshelter) have been assigned to the Nubian Complex, too. More has found in Arabian sands: Rose et al. report the discovery of a buried site and more than 100 new surface scatters in the Dhofar region of Oman belonging to the late Nubian Complex. Two optically stimulated luminescence age estimates from the open-air site of Aybut Al Auwal in Oman place the Arabian Nubian Complex at ca. 106,000 years ago, providing archaeological evidence for the presence of a distinct northeast African Middle Stone Age technocomplex in southern Arabia sometime in the first half of Marine Isotope Stage 5. The MIS 5c assemblages at Katoati represent in the Thar Desert is the earliest securely dated Middle Palaeolithic occupation of South Asia. Nubian cores and their artifactual products identified in both MIS 5 and MIS 4–3 boundary horizons match technological Paleolithic entities observed in South Asia, Arabia and Middle Stone Age sites in the Sahara. The evidence from Katoati is therefore consistent with arguments for the dispersal of Homo sapiens populations from Africa across southern Asia using Middle Palaeolithic technologies. The Nubian Complex, which is thought to have originated in sub-Saharan Africa, is attributed by some researchers to populations of anatomically modern humans spreading via the Nil valley to Northern Africa and South West Asia and via the Bab al-Mandab to other parts of Asia , which is in my view a reasonable working hypotheses. For a deeper view see: 1659 .